TO RISE AGAIN: The Satok Suspension Bridge will be rebuilt soon. It is seen here in the 1990s. KUCHING: It may have been nearly eight years since the Satok Suspension Bridge collapsed, but the once-iconic landmark still has a place in the hearts of many. In its 78 years of existence, the bridge grew from a mere structure linking Kuching to Petra Jaya to a symbol of sweet memories. Tourism Minister Datuk Amar Abang Johari Tun Openg’s recent announcement that the design of a replacement bridge has been approved and location identified has been well received. A quick check online and chats with locals found many agree that the bridge should rise once again. Sarawak Heritage Society committee member Datuk Wee Hong Seng said he hoped the replacement bridge would not stray too far from its original design and location. 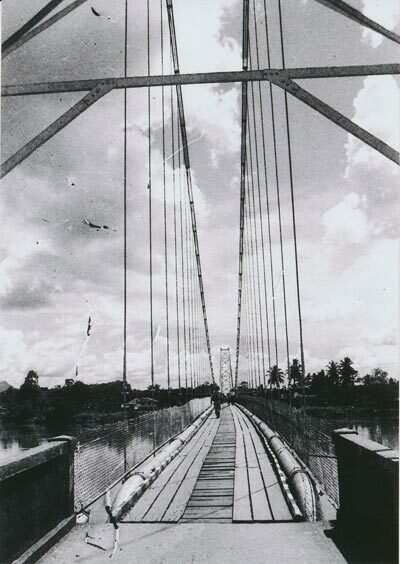 ICONIC LANDMARK: A photo taken in 1988, the same year Awang Mahyan and company jumped off the bridge to celebrate Sarawak’s victory against Johor. 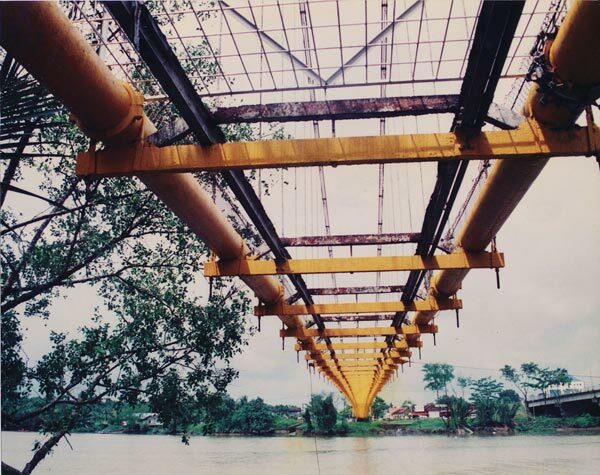 UNDERSIDE: The Satok Suspension Bridge in 2003. The bridge would collapse the following year after a storm. “In the days when we did not have as many tourist attractions in Kuching, this bridge was one that every tourist must visit and cross if one dared. It was an icon for Sarawak and gained a historical and heritage value over the years. “Because of that, I hope the new bridge to be erected will not be a modern one but one as close to the old one as possible in terms of its structure, to give to it a sense of antiquity even though it may not be the original bridge,” said Wee. Santubong Member of Parliament Datuk Wan Junaidi Tuanku Jaafar, who grew up near the suspension bridge, recalled that the structure was linked to ghost stories and strange legends among villagers. “We were told that the bridge was haunted as they were skulls buried under both ends of the foundation, as offerings, to ensure that it would stand and stand forever. “We were also told that we were not to jump into the river because swarms of bees would emerge from the water if we did so,” said the Deputy Dewan Rakyat Speaker. Despite the scary tales, he still has fond memories of the bridge. “I remember in the 1950s, when I was small, my family and I took the Matang Bus, which was more of a tram, to cross the bridge without us having to alight the bus when crossing. “But in 1960s, the bus could still take about six passengers but we had to alight from the bus while the bus was crossing the bridge and we had to walk behind it,” said Wan Junaidi. He also recalled re-enacting sword-fighting scenes from movies with his friends on the bridge and playing ‘Tarzan’ by swinging from the bridge to the river bank. Legendary former Football Association of Sarawak (FAS) ‘Nyap Sayot’ coach Awang Mahyan Awang Mohamad also hopes to see the bridge rebuilt. In 1988, he led a group of over 100 – including half his team – to jump off the bridge into the river when Sarawak qualified for the Malaysia Cup semi-final after beating Johor. “There was a sense of fulfilment when I jumped. And if my health permits it and the bridge is rebuilt again, I may well again do it if the FAS takes off again,” said the 62-year-old former coach. 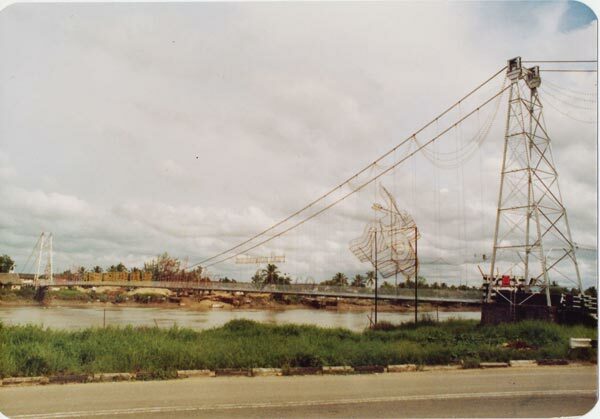 The Satok Suspension Bridge, which collapsed at 4am on Oct 7, 2004 – a day after a storm – was first mooted in 1902, but its construction only began in 1923 at a cost of US$52,000. Completed in 1926 by architect AS Lowe to hold 0.3m water pipes connecting the reservoir in Matang to Kuching town, the bridge nicknamed ‘San Francisco Bridge’ was mainly for pedestrians as it only allowed vehicles up to 1,360kg. 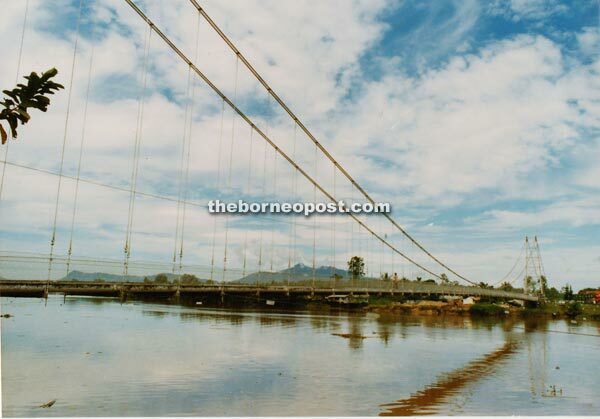 It was 130 metres long and 2.3 metres wide, suspended 18 metres above the Sarawak River.